DDR4 is alive and well. But when is it coming? DDR4 is real. That was the main takeaway from the Intel Developer Forum (IDF) panel discussion on the next-gen memory standard. The great and the good of the memory industry, from Intel to Micron, were there trying to impress on everyone that the long-awaited successor to DDR3 is actually alive and well. Though exactly how well it is still remains up for debate. What isn't though is where it'll turn up first. 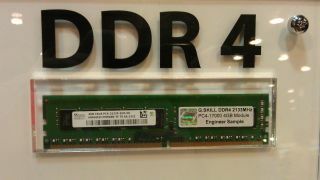 DDR4 is set to be a server part for the time being with the desktop and notebook variants coming a good while after. "We expect to see DDR4 in desktops and notebooks maybe a year after the server," explained a representative from Kingston on the show floor. If that's true we should see DDR4 filtering down into our desktop machines sometime in 2015 - memory companies are set to start shipping server-grade memory next year. Samsung isn't so sure about the move to our desktops though. Around the corner from the Kingston booth on the IDF floor was the Samsung booth, showing off its own selection of DDR4 modules. I asked if the South Korean company agreed with Kingston in terms of the consumer time frame and its representative was much more sceptical. Samsung is predicting that DDR4 will most likely not turn up in our own machines until after 2015. That's a long way away and we could well have a very different computing ecosystem by then. What all the memory companies do agree on though is the benefits of DDR4, and not just in the server space. "Memory has a pretty big impact on performance, next to the processor it's the fastest component in the system," explained Kingston. "For DDR4 it's the next step up in speed and it also requires less power. DDR4 starts at 1.2 volt, so right off there you're seeing anywhere between 15-20% savings on power consumption. So for the consumer, that's more battery life, better cooling and better performance." There's also the fact we're looking at far higher possible densities in individual modules with DDR4. The last generation of memory ranged from 512Mb up to 8Mb. With DDR4, that's moving up to between 2Gb and eventually 16Gb. That will enable far higher capacity DIMMs than we can manage right now. We're also looking at around a 50% increase in memory bandwidth moving forward. But the big factor impacting the transition to DDR4 is going to be price. If the DDR3 market remains tight then that's only going to lengthen the lifetime of the last-gen memory. Depending on price then, even Samsung's more conservative prediction of the consumer transition to DDR4 could turn out to be rather optimistic. Now why not check out IDF 2013: all the latest from this year's conference.